How can I choose the best grain free puppy food? Hi there puppy lovers! We’ve recently been receiving lots of questions from you about grain free puppy food. Mostly, we’ve been asked about the benefits and characteristics of a diet that’s entirely grain free. How to transition your best friend to a grain free puppy food. So, we’ve covered the answers to all these questions and more, as well our top picks for the best grain free puppy foods. Woof! What’s a grain free diet? Why do puppies need grain free puppy food? How do I feed my puppy a grain free diet? Best grain free puppy food for all doggy sizes! How do I know if my dog is allergic to grains? My puppy is not allergic to grains, but he reacts badly. Why? A puppy on a zero grain/grain free/no grain diet doesn’t eat any grains at all. So no wheat, no soy, corn, barley, rye, or rice, among other things. Different puppy food manufacturers often have different stances on whether your best friend’s dinner should contain grains or not. Some argue that grains, like rice, are a natural source of carbohydrates that puppies need for energy. Others believe that puppies do best when fed on high-protein, meat-based formulas that cut out the inessential carbohydrates. But whether you come down on one side of the fence or the other, it’s always worth knowing what’s on the market. It’s important to understand that a grain-free diet is not the same as a gluten-free diet because some grains do not contain gluten– oatmeal is a good example of a gluten-free grain. Puppies who are allergic to gluten should probably be fine with some grains, while those who can’t tolerate grains need to be entirely grain-free. It is worth noting that a lot of owners choose grain free puppy food over regular puppy food because grains like corn and wheat are commonly used as ‘fillers’. Because these grains are often cheaper than real, high-caliber meat, they’re often found in poorer-quality puppy foods as a way to bulk it up and produce it economically. First and foremost, puppies who are allergic to grains need to be kept on a strictly no grain puppy food diet. It’s also advisable for those puppies who have intolerances (which are different from allergies) to stick to grain free puppy food. Just like you and I wouldn’t eat something that makes us feel itchy or sick, our puppies deserve a yummy dinner without any discomfort! Has nutrients and oils like DHA, chondroitin, and glucosamine for healthy puppy growth. Avoiding table scraps – no matter how cute their puppy dog eyes! Feeding your little one with the best grain free puppy food doesn’t have to be hard. We’ve picked out the top brands that not only skip the grains but also have heaps of other health benefits. As per our usual high standards, we’ve factored puppy size into our equations, too. So there’s something for every puppy! Well, well. 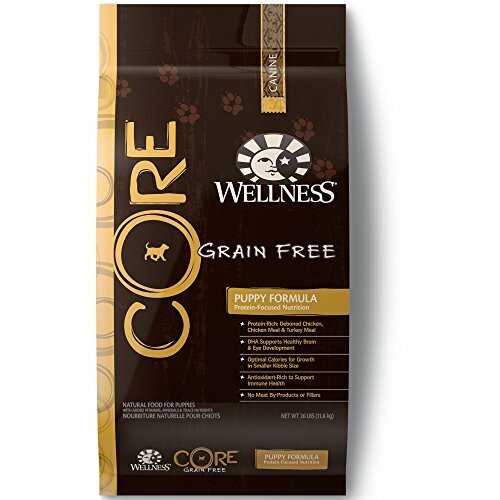 Looks like Wellness has made another one of the best no grain puppy foods for our little fluffy friends! With zero unnecessary artificial colors and flavors, rich protein, and lovely garden veggies, we even have a few (canine!) team members who give this grain free puppy food the paws up! A super grain-free supper for all pups, from the smallest Yorkies to the largest Great Danes, at 417 kCal in each cup! Nope, sorry, we’re loving this Wellness grain free dog food for puppies! 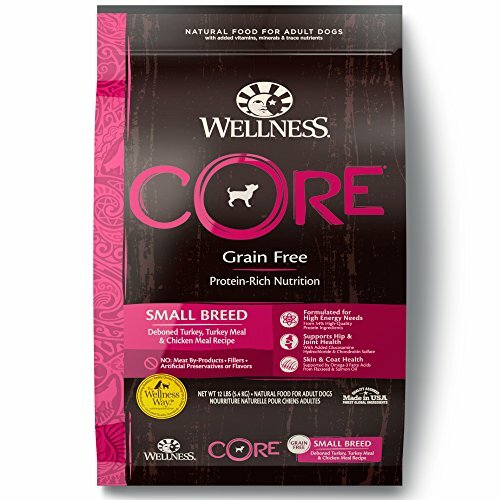 What can we say, really – we’re having a hard time finding anything not to like about Wellness Core for Puppies. And so do our adorable puppy friends! 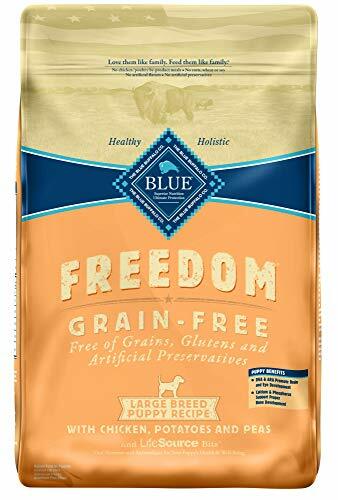 Blue Buffalo’s grain free puppy food is 100% without synthetic preserving, coloring, or flavoring agents. And of course, it’s also entirely without gluten. Suitable for all puppy sizes (and shapes! ), Blue Buffalo grain free is made from all-natural ingredients. Top ingredient’s boneless chicken…for 27% yummy protein! 2% calcium, for strong growing bones and healthy teeth. If your pup’s allergic to potatoes, he won’t be able to tolerate this particular no grain puppy food. Blue Buffalo makes one of the best grain free puppy foods out there, we reckon. We’re always happy to feed our little (and bigger!) puppies with this artificial additive-free, gluten-free chicken winner. Orijen ‘Biologically Appropriate’ grain free puppy food is full of a range of awesome different meats – the idea being, variety is great for puppies in general. This formula features colorful veggies like pumpkin, kale, and butternut squash alongside your puppy’s tasty favorites. Meat, of course! Superfoods, here we come! 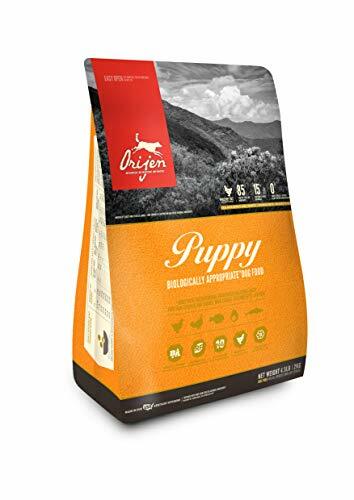 Orijen Grain Free Puppy Formula’s got all the vitamins, antioxidants, phytonutrients, and minerals of yummy spinach, mustard greens, kelp, and fruit like apples and pears! Contains not only fatty acids Omega-6 and 3, but DHA, too. The joint-healthy chondroitin and glucosamine in this blend are from natural sources. Like real meat, rather than synthetic additives. And we like natural, don’t we! If you’ve got a hungry, growing pup, you may find the cost per bag is slightly higher than other, less premium brands. When puppies aren’t eating too much of a specific ingredient, they’re less likely to develop an intolerance to that ingredient. Orijen Puppy Formula helps your puppy to avoid this by using a diverse range of proteins, from poultry and fish to eggs and chickpeas! There’s not one single gluten-containing ingredient to be found in this chicken and sweet potato dinner (and breakfast, and lunch, puppies eat a lot!). Instead, you’ll find cute little kibble designed for puppy jaws, packed full of protein and yummy healthy fat. 28% protein, alongside 12% natural chicken fat, both great amounts for growing little ones. We’ve put only the best grain free puppy foods into our review, and we can’t find anything wrong with this one either. Our Husky puppies adore it! Cooked in the States, zero cheap by-product fillers, and no synthetic preserving chemicals. 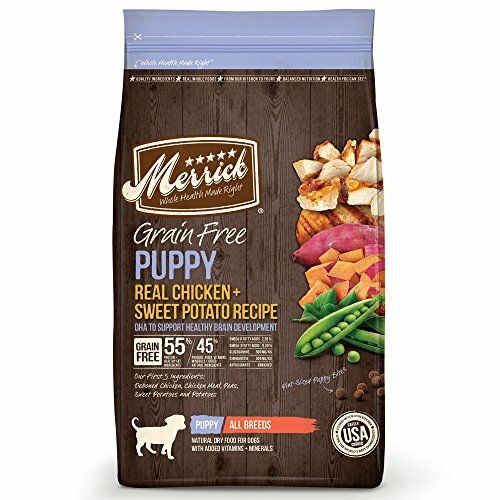 We’re 100% happy with this gluten-free blend and think it’s one of the best grain free puppy foods available. Yep, Blue Buffalo has done it again! This time for large puppies though, and it’s a delicious-sounding chicken, pea, and potato blend that’s rich in L-Carnitine for lean and healthy muscle development. Calcium’s at the 1.2% level for those soon-to-be-very-large bones. Woof! Woof! Nope, even the price is great considering our big puppies eat A LOT! Blue Buffalo never puts artificial/synthetic preserving chemicals or flavors in any bag with the ‘True Blue Promise’, and this no grain puppy food’s no exception. Plus, it’s got protein-packed chicken meal, but absolutely zero milled chicken by-products. Yay! Another Wellness Core winner! Chihuahua, Yorkie, Daschund, and small mixed-breed puppy owners will find this turkey and chicken recipe high in calories to keep up with the fast development of their little (and tiny) best friends. 36% protein for little dogs, which is great because smaller breeds need greater nutrients from smaller meals. Basically, filler-free awesomeness! Natural sources of vitamins and minerals, as well as antioxidants, from real greens like parsley, apple, kale, broccoli and carrot – and green tea extract! Perfect for young pooches of between 2 and 25 pounds, which includes toy puppies, too. If you’ve got a little pooch with potato allergies, he’ll need a different formula. It’s all USA-made, and it’s developed especially for little pooch puppies. We’re happy about its higher calorie content, joint and hip health formula, and super protein content. On top of this, it’s easy for our pups to digest thanks to gut-healthy probiotics. Turkey’s up! Here’s a welcome change from both dry kibble and chicken being the star of the show. 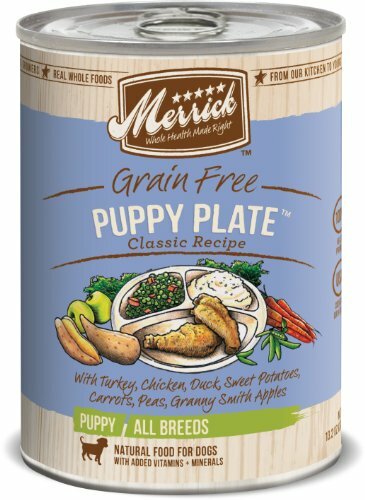 Real veggies, grain free, and apparently super-yummy, this Puppy Plate is a great way to treat your puppy. Gobble, gobble! Peas, sweet potato, carrots, and apple for a whole lovely bunch of vitamins. Natural vitamins K, C, B2, B1, and E, to name a few! 5% fat, also just right for growing pups of all sizes. Although, you’ll want to feed giant and larger dogs a little more of this at mealtimes. ..carrying the cans from your pantry? Just kidding, it’s great, and we’re giving it five stars! Merrick has really, really grown in popularity with puppy owners since the brand kicked off in 1988. They have an organic-certified plant and this turkey meal’s a great example of the healthy puppy food made there. If you’re worried that your puppy might be suffering from any form of food allergy, the best (and first!) thing to do is take him straight to his vet. Your vet will be able to carry out the necessary tests that can help identify what exactly it is he’s allergic to. Common symptoms of food allergies, including grain allergies, can include vomiting, bad gas, diarrhea, and tummy upsets. In extreme cases, unfortunately, puppies can react to food that they’re allergic to by going into anaphylactic shock, just like humans. Puppies and dogs who have a suspected food allergy will generally be put on a food elimination diet by their vet. This can take up to three months, during which your fluffy friend will trial-and-error different foods that leave out the suspected ingredients. Best practice says you should take your puppy to the vet, as it is possible that he may have an intolerance to grains or gluten. Puppy food sensitivities, also called intolerances, are not as serious as allergies. They can, however, be deeply uncomfortable for your puppy. Pups with grain insensitivities may demonstrate gastrointestinal distress – like with allergies, this can manifest as diarrhea the day after they eat something with grains. Foot, ear, or skin infections can also be a result, as well as itchiness. If your puppy doesn’t take well to his food, it’s highly recommended you visit his vet. There’s always a chance that it’s not grains or gluten causing the problem, but another ingredient. Your vet should be able to help or refer your puppy to a specialist who can. What Are The Best Puppy Foods For Sensitive Stomachs?